"thank you again for the phenomenal customer service!!! We continue to be very happy with our towers … and our cats even more so! " “With CRIJO trees, volunteers save an estimated 9 hours of cleaning a week,time that can be devoted to other tasks to improve the lives of the cats. Working with Grant Smith of Crijo Pet Products, LLC - a wonderful experience! First, Kitty Cribs, enhancing the Central PA Humane Society's confined cats mental and physical well being; then moving onto the new Cattery "multi" room requiring durable, cleanable, versatile structures suited for both kittens and cats. What an amazing find! Having perused his website pictures, we exchanged ideas and, meeting our very short time frame, we had feline furniture that simply takes your breath away. Grant's craftsmanship and creativity is unbelievable. The kittens and cats are happy, the public is delighted and adoptions are up. Many thanks from CPHS. I have had the opportunity to see and sample several items produced by CRIJO. When budget restrictions are lifted I will be placing orders for items to enrich the lives of the cats in our facility. The Items are functional, as well as durable and attractive to the visitors to the shelter. The size cat shelves work wonderfully with the new cage size requirements, the cat furniture gives hours of relaxing or much needed exercise. The companies itself has been very helpful and understanding of our budget crisis and continues to work with us and send information on their new items and specials they occasionally have. I look forward to the arrival of our upgrades for our animals. 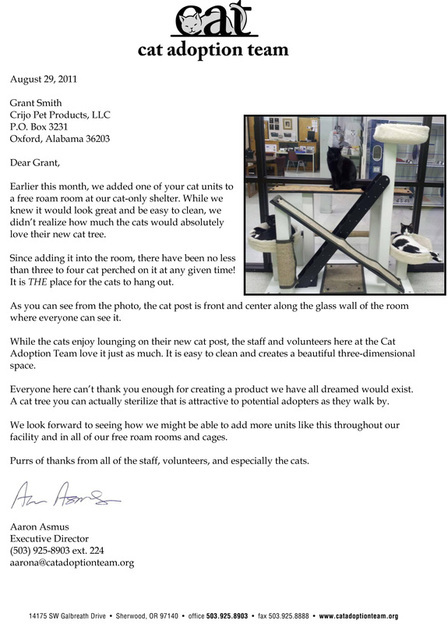 We have been using Grant Smith's CRIJO Plexiglas inserts in our cat boarding room for several months now. Our feline boarders have given them rave reviews! These inserts are a perfect fit inside our shore-line cages and our feline occupants, both big and small, always seem to be immediately comfortable with these inserts in the cages. It's really great to be able to offer our boarders more surface area to lounge and climb around on. I also like that there is a separate place for a small litter box which helps to keep the litter under control. These inserts are very easily removed and sanitized. At some point, when we expand our feline boarding space, I will be adding additional inserts as well. These inserts are constructed with a cat's instincts and comfort in mind and are a hit in our hospital! As a feline only veterinarian for the past 5 years and the proud owner of twelve indoor only cats that all have their claws. I know how important the appropriate environmental enrichment is for cats. Cats instinctively need to scratch in order to mark their territory and groom their nails and they like to get a full body stretch in doing so. They also like to be perched up high to see the views or take a nap, etc. Products for these purposes that are currently available on the market often do not fulfill these needs. However, consumers do not understand this and this can in turn lead to destructive and inappropriate behavior by their frustrated felines. CRIJO products not only meet the unique needs of cats but do so in a sturdy and attractive manner. The all natural sisal fiber used for the scratching surfaces provides a strong substrate for cat's to pull against and satisfy their grooming and marking needs. The bedding is plush and often removable for laundering. Everyone can find something to match their decor so these feline musts will not be an eyesore amongst their furnishings. These products are extremely well made and so diverse that both humans and felines alike will be thrilled with any CRIJO creation. I highly recommend CRIJO products for your felines, they deserve them! I have used two products produced by the CRIJO company. These were especially designed for cats. I bought the acrylic cage inserts for cats. We put them in the cat cages and the cats sleep on top of them and the litter pan goes underneath. The cats seem to like them very much. They fit my stainless steel kennels that are 2 feet wide very well. I also bought a cat climbing tree with 2 sleeping areas. My cat enjoys it a lot and sleeps on it all the time. I put it in the window and he sleeps on it and looks out the window. The products are of excellent quality and are very durable. I have enjoyed them both. 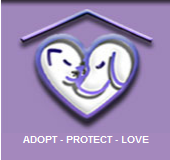 I am the Animal Care Manager of the Humane Society of South Central Michigan. We are enjoying the plastic inserts purchased for our Shor-Line stainless steel kennels. They have served a very important purpose as these kennels do not have shelves in them. I have been told and know that cats like to perch above things and it also gives nursing mothers space from their babies from time to time. For the smaller cages we have small litter boxes that fit in one side of insert and then for the larger cages there is plenty of room. They are durable and easy to clean. I would recommend them for the Shor-Line kennels. We are extremely pleased with the new acrylic kennel inserts that we are now using in our stainless Shoreline Kennels in our cat isolation and treatment rooms. It allows our cats to have much more space when having to be kenneled during their quarantine period as well as the sick cats receiving treatment for illness. Until now we have not been able to find a product such as yours that enhance the comfort of our cats in kennels. Our kennel staff and volunteers are pleased with their durability as well as how easy they are to clean and sanitize which is also very important to us! We would highly recommend these inserts to any shelter, clinic, or boarding facility that are housing cats in kennels like ours. Our cats especially thank you for introducing us to these inserts because as you saw at our adoption center, they now have a perch as well as a cubby area to sleep and play! Thanks again for another wonderful CRIJO product that makes the lives and comfort of our cats much more pleasurable!